Dag Hammarskjöld was born in Jönköping in the South of Sweden in 1905, but grew up in Uppsala, where his father, Hjalmar Hammarskjöld, was governor for many years. In Uppsala, Dag Hammarskjöld lived at the castle, which functioned as the governor’s residence, with his parents and three brothers. HIs father became Prime Minister during the First World War, but later returned to Uppsala as governor. Dag Hammarskjöld was an outstanding student with top marks at school. After studying law and economics, Dag Hammarskjöld became a successful civil servant and expert in economics. He was a non-political member of Prime Minister Tage Erlander’s Government between 1950 and 1953. 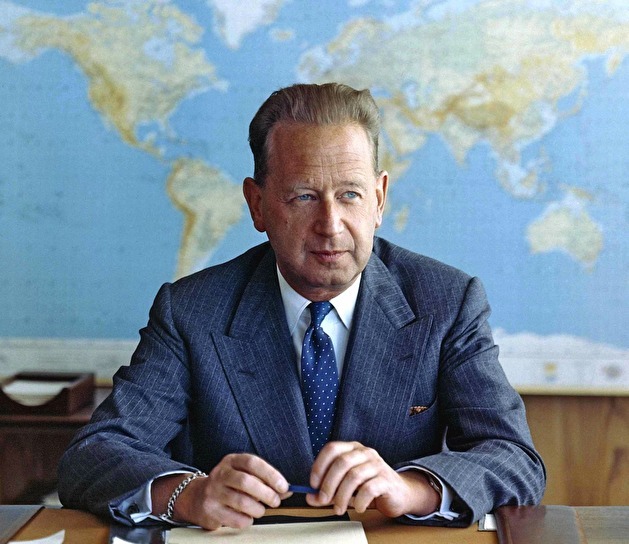 In 1953, Dag Hammarskjöld was elected as Secretary-General of the United Nations. Dag Hammarskjöld was the Secretary-General of the United Nations between 1953 and his death in 1961. He is one of the most famous Swedes of modern times. As Secretary-General, he succeeded in developing the United Nations, not least its ability to prevent and resolve conflicts. "Only he deserves power who everyday justifies it." During his time as Secretary-General of the United Nations, Dag Hammarskjöld actively supported the role of the United Nations in relation to small states. He successfully mediated in a number of crises. President John F Kennedy called him ’the greatest statesman of his time’. His plane crashed during a mission to mediate in the conflict in the Congo in 1961. He was awarded the Nobel Peace Prize posthumously in 1961 for his work for peace. Dag Hammarskjöld had a great interest in art and a large art collection. Music, theatre, opera and modern design were only a few of the cultural areas he showed interest in. He translated the work of several famous authors into Swedish. Vi skriver bildtext under bilderna. Dag Hammarskjöld was also an author and member of the Swedish Academy, where he inherited chair number 17 from his father. After Dag Hammarskjöld's death, his collection of writings, ’Markings’ was published. It remains a much-read and beloved book today. Dag Hammarskjöld was also a nature-lover. He was an avid mountaineer and hiker. He often hiked in the Swedish mountains, and photographed the Swedish nature, from North to South. The soft, rolling landscape surrounding Backåkra was particularly dear to his heart. Despite his heavy workload as the Secretary-General of the United Nations, he took time to spend what holidays he had in Österlen, and bought Backåkra in 1957. "Landscape: only your immediate experience of the detail can provide the soil in your soul where the beauty of the whole can grow."